At the request of Count Frontenac, governor of New France (Canada) and emissary to King Louis XIV, French-Canadian fur trader Louis Jolliet (Joliet) and French Jesuit missionary Father Jacques Marquette set out from the Straits of Mackinac in 1673 to explore North America and search for the Mississippi River. Their goal: find a waterway that could connect the Great Lakes to the Gulf of Mexico. Marquette and Jolliet navigated 2500 miles by canoe in 120 days, and while they didn’t find a direct waterway, what they did find, with help from local Native Americans who knew it well, was a short portage – a route where they could carry their canoes over land (and at certain times of year, when the water was high enough, continue through the water) and ultimately connect Chicago and the Mississippi. That little portage was very important indeed. 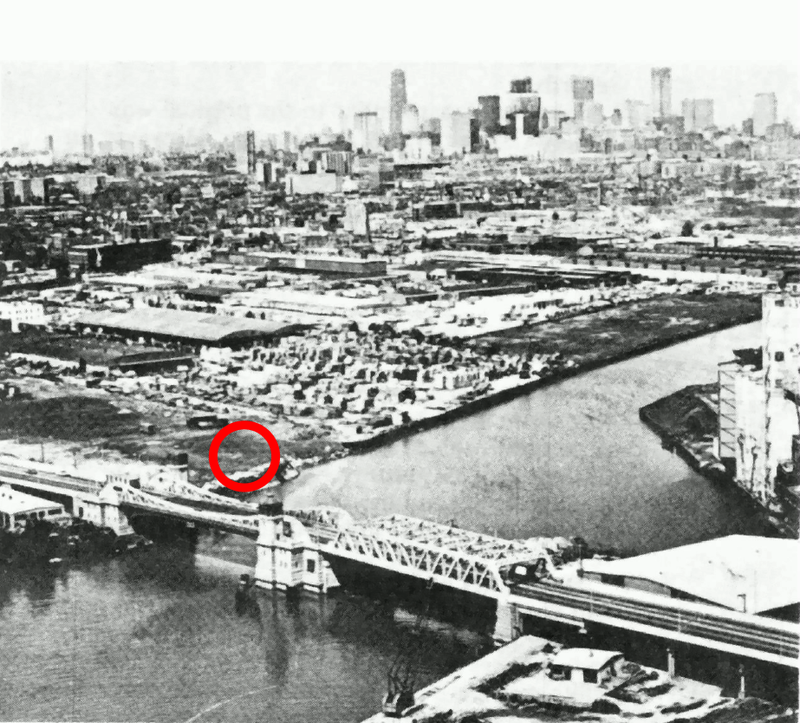 It changed the future of Chicago, placing it right in the middle of a waterway that stretched all the way from the St. Lawrence River to the foot of the Mississippi. It would also change everything for the Native Americans. The “Chicago portage” later was excavated into the Illinois and Michigan Canal, and later the Chicago Sanitary and Ship Canal. During their explorations on the return trip up the Chicago River, Marquette camped for the winter of 1674 at a spot that is now where Damen Avenue intersects with the Sanitary and Ship Canal. 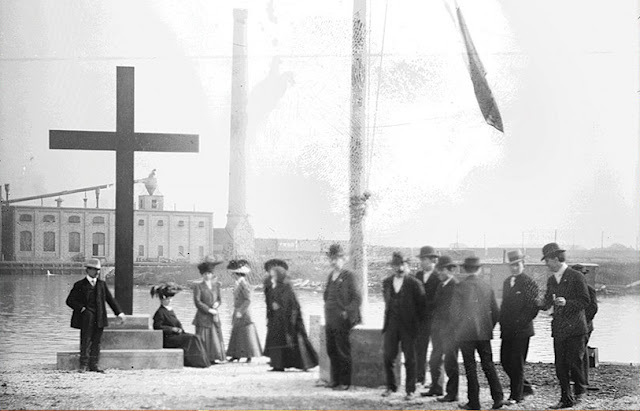 In 1907, a large cross was erected on that spot to honor Marquette and Jolliet. The cross is no longer on the site, but a plaque still marks this important early exploration into this area. 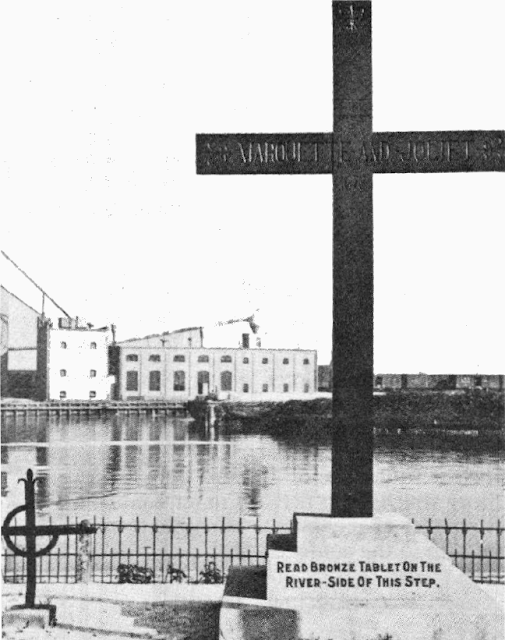 In 1907, grateful local business owners commemorated the expedition of French-Canadian fur trader Louis Jolliet and French Jesuit missionary Jacques Marquette by placing a large cross and a plaque at the point where Damen Avenue meets the Sanitary and Ship Canal. Old photographs document an early mahogany cross where Robey Street [now Damen Avenue] ended, on the left bank of the West fork of the South arm of the Chicago River. 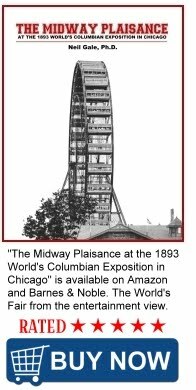 It was designed by Thomas A. O’Shaughnessy and erected on Sept. 28, 1907, by the Willey Lumber Company, guided by the Chicago Historical Society. Photograph shot from across the Chicago River. This text was taken in 1907. ["... It would only be necessary to make a canal, by cutting through but half a league of prairie, to pass from the foot of the lake of the Illinois to the river Saint Louis... which falls into the Mississippi..." Relation de la descouverte de plusieurs pays situez au midi de la Nouvelle-France, faite en 1673 - Quebec, le 1er Aout, 1674]. This original cross was sawed off and carried away by vandals on Aug. 11, 1914 but was replaced by a very similar cross on May 16, 1915. 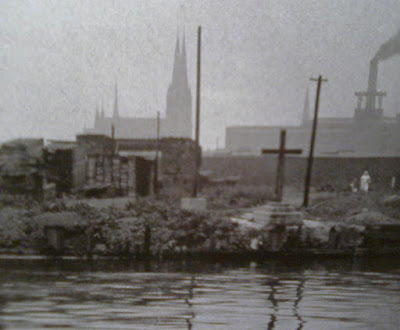 Also shown on the 1907 photograph is a small iron cross to the left of the large wooden one, with its own history. It is said to have memorialized only Father Marquette, been present in this location since at least 1898, and still existed in 1950. 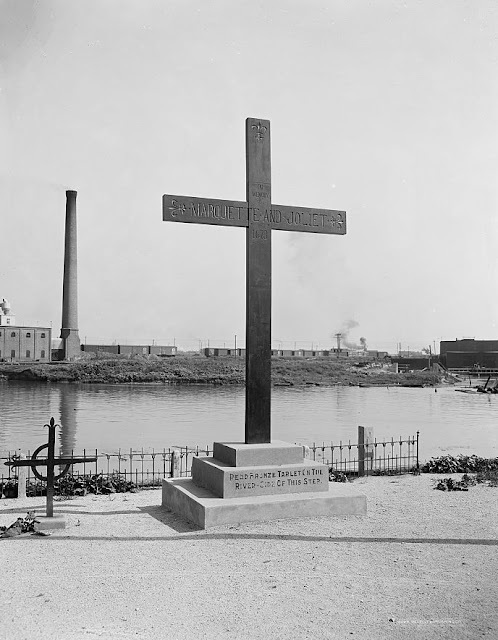 On Feb. 29, 1924, a Chicago Daily Tribune article announced that the large wooden cross would have to be removed because a bridge needed to be built across the river at the lower end of Robey Street, with a replacement to be considered nearby. This replacement turned out not to be another cross, but the Marquette 1930 bas-relief sculpted monument with bronze plaque. The circle on this picture indicates the approximate site of where the cross was. 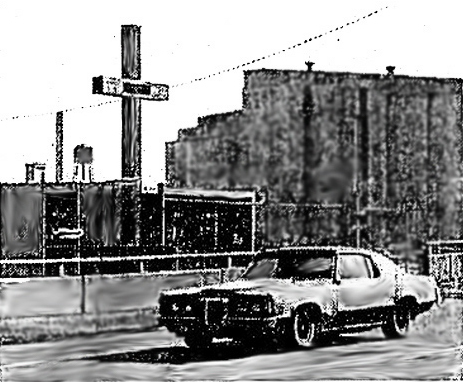 The Marquette Cross Chicago, Illinois - 1973. A 20-foot rough cedar cross at 2639 South Damen Avenue, just north of the bridge over the Chicago River's south branch, with an inscribed bronze plaque: "Near this Site Father Jacques Marquette, S.J., Missionary, Explorer and Co-discoverer of the Illinois River, spent the Winter of December 1674 to March 31, 1675." This photograph is from a 1976 Chicago Tribune article. Erected during the tricentennial observances of the voyage by Marquette and Jolliet, the cross was dedicated by John Cardinal Cody on Sept. 1, 1973. The cross is no longer there as of 2008.